Are Your Hounds The Talk Of The Town? DIY Super Chic Dog Coats! Susan from Yorkshire was selected by sewing blogger extraordinaire, Kerry @PennyDog, as a finalist in our Big Spring Contest, to make a pair of luxurious, designer dog coats for her two dogs, Lily and Rolo. 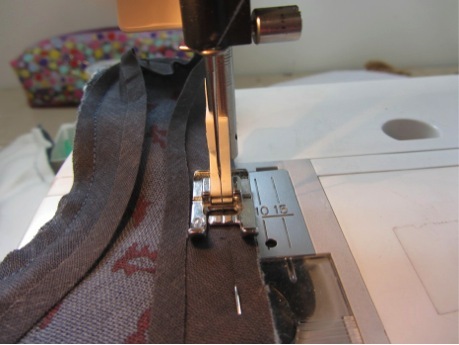 She’s sent in her step-by-step guide of how she made them, so that we can have a go at home! And what a gorgeous present they’d make for someone’s pets! I’m already itching to get going on one for my friend and her gorgeous golden retriever. The best part of her method is that each coat fits her dogs perfectly, and also rids of the things we hate on commercial dog coats, like those nasty velcro straps that get caught in our poor dogs hair! 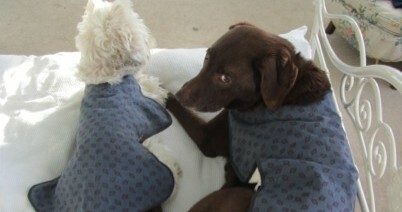 I also particularly love her sophisticated choice of fabric – Lily and Rolo are undoubtedly the most chic in the park now! As part of the “Big Spring Contest“, I put forward the idea of making DIY ‘designer’ dog coats for my chocolate labrador, Rolo and west highland terrier, Lily. Their winter coats were in need of replacement with something much more spring-like, lighter, stylish and with warmth to counteract the fresh winds in this part of Yorkshire. 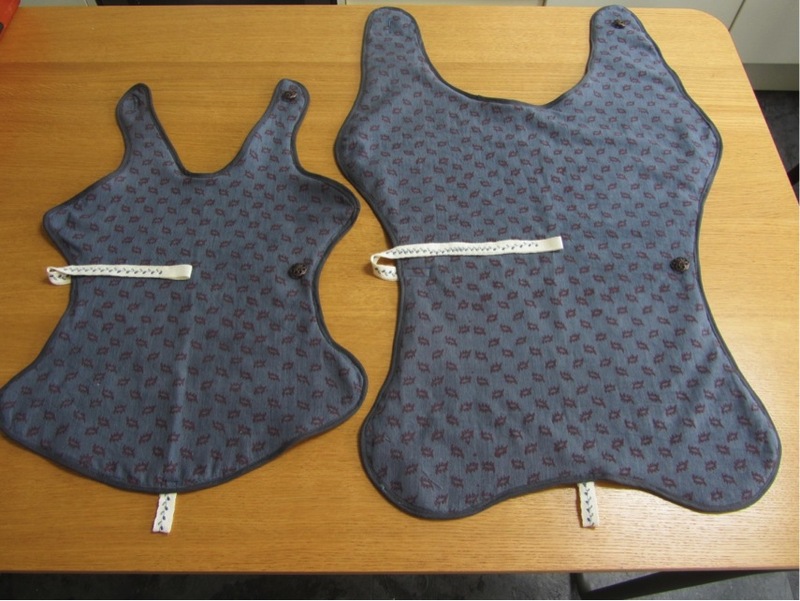 I selected two fabrics: an amazing cream organic fleece for the fabric closest to the dog’s body and an outer shell of an organic Pankha hand block print in blue with a ‘rusty’ coloured leaf design. The fabulous material made it a joy to design the coats. It was tempting to make them too cute with little Peter Pan collars and a little bow belt round the middle – but my daughter saw the outer fabric and said it was just too ‘heritage’ to be overly fussed over. So it was more a case of would it pass the Bloomsbury set’s high standards – and it did. The fleece is beautiful, soft, flexible, and very warm. A – base of neck to bottom of spine. B – centre of back to bottom of shoulder. C – centre of back to bottom of hip. 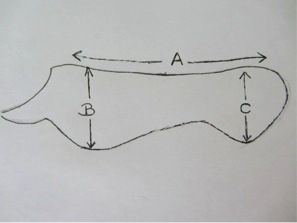 Measure your dogs from the nape of the neck to the base of the tail. Then measure across the shoulder and hip. Create a rounded shape to cover the joints which need protection and is ‘streamlined’ to ensure the coats don’t get overly dirty underneath. 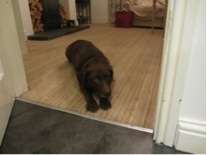 Then create a toile from scrap cotton fabric and try it on the dogs! Make any made minor adjustments to the cotton toile to ensure a good fit. Then transfer this cotton toile to a paper pattern by simply drawing around the shape. Lay the paper pattern on to the outer shell and cut it out (the pattern should be symmetrical so it shouldn’t matter which way around). 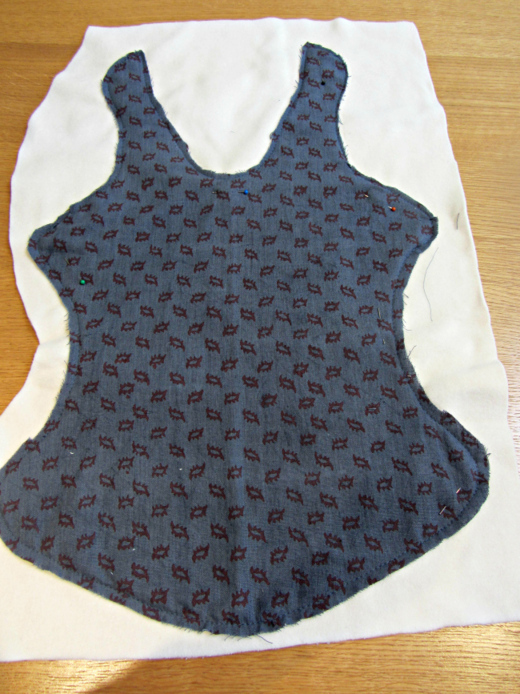 Lay this cut out shell onto the warm fabric – in my case fleece – wrong sides together and join both pieces with a long tacking stitch. 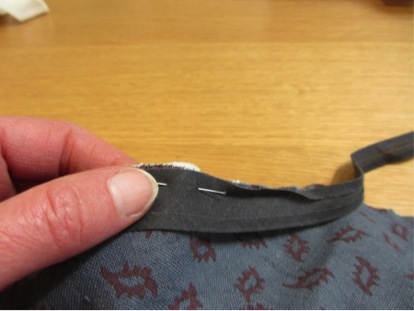 As the top layer is already tacked by hand, you can then attach by sewing machine. With the fleece tacked in place, cut the fleece to the shape of the outer shell and finish the coat by encasing the seams with a matching bias binding tape. I chose tape and button fastenings because I find that Velcro on commercially produced dog coats get caught on the dogs’ hair and becomes soiled quickly. 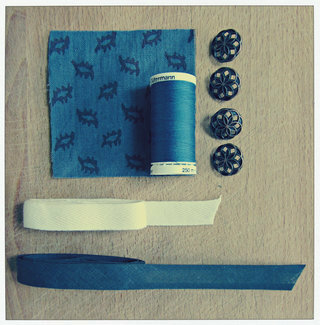 I chose these particular buttons, not just for their lovely design and colour, but they were on a shank which makes them easier to button up when putting the coats on moving dogs. 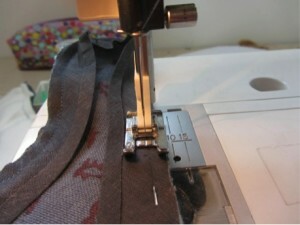 I made a strong buttonhole on the sewing machine with a gimp thread running through the opening to strengthen it. I also used the same herringbone tape from Offset Warehouse to add another design feature: hanging hooks. I strengthened the tape by folding it on itself, essentially doubling it up and securing the layers together with a machine embroidery stitch in a leaf design to reflect the design on the outer fabric. Using this embroidered tape I created the strap that would sit under the dogs’ tummies and fasten to the button on the other side, and also some little loops at the base of the coat to allow them to be easily hung up after a walk! 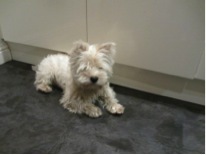 Here’s a little slideshow of the results!